snacks | Dad's In The Kitchen Blog! Dad's In The Kitchen Blog! 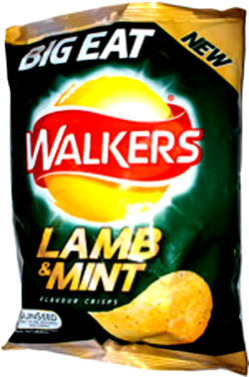 These chips are down. In a good way. It’s January. The month that makes climbing out of bed in the morning especially slow, and that first cup of coffee particularly welcome. My youngest has learned January is named for the Roman god Janus, a guy with two faces, one looking right, one looking left. It’s apparently a warning for this time of year. Check both ways for chariots or disasters before crossing the street, going to work, leaving the house. Those Romans knew a thing or two. Even the dog hangs back before going out. When she comes back in she noses round the kitchen floor, expecting bits of fallen doughnut or pastry. She gives me a look. It’s a diet, I tell her. Foraging for snacks in the bag becomes very tempting, this time of year. They were let in the house for the holidays, all the ‘itos’ and their relatives. But they’re banished now, because if you let them stay, they’ll never, ever move out. The kids complain to me, after school they’re hungry. So one evening I go looking for some relatively healthy way to put chips on the table. 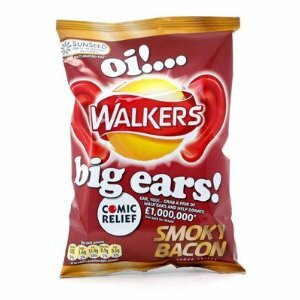 Now, you may not be aware, but in the UK, potato chips … alright, crisps … are a matter of huge national pride and culinary investment. Their varieties put Americas’ to shame, with our paltry choice of BBQ, plain or ruffled. The concept there is to get an entire meal onto the chip. 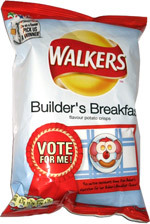 Builder’s Breakfast This potato chip has the flavour of eggs, sausage, bacon, toast and beans. It won a competition worth 50,000 pounds for it’s inventor (that’s money, not fat). Strangely, it’s recently been discontinued. 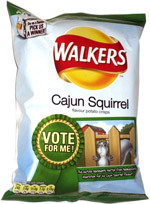 Cajun Squirrel This is reported to taste nothing like squirrel – I couldn’t tell you – but is nice and spicy. 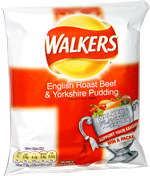 English Roast Beef and Yorkshire Pudding To reviewers this one apparently tasted more like beef stew than a true roast. To which I say, hey, what can you expect from a chip? 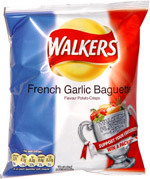 French Garlic Baguette, not too hard to imagine, is it? 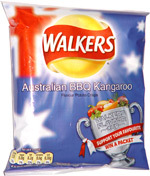 Australian BBQ Kangaroo, which the company swears contains no marsupial, none. Do we see a trend here? 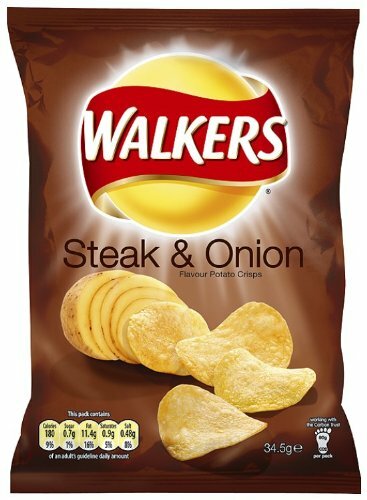 These are all sold by Walkers, which is owned by Lays, which apparently doesn’t have the guts to bring them to the states. Not that I’m suggesting they should. Or that anyone should eat them. But as a diet concept, you have to wonder if maybe a meal in a bag has some potential. To conduct a little research of your own, there’s a link on http://www.dadsinthekitchen.com to Amazon, where you can order a bag. Strictly for scientific purposes, of course. Anyway, with the kids still grumping about wanting to move in with the Pringles, I came up with a dad’s-friendly way to turn that bland, healthy bag of corn tortilla chips in the cupboard into something far more interesting. The end result is a crisp bbq smokey hot wing – or if the kids don’t like the heat, you can scale back or drop the added chili. 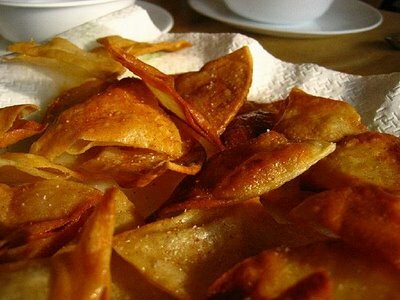 Using the brush, apply a light, thin coat of the flavoring to the tops of the chips. You don’t want to make puddles, or leave the chips wet. A light coating. Bake in the oven for 4 to 8 minutes, til the flavoring is dry, but before the chips cook. If you want to add and melt cheese, take them out at 4 minutes, sprinkle the grated cheese, and return til the cheese is melted. one father's musings about kitchen stuff a man needs to know, but nobody else bothers to tell you. Enter your email address to subscribe to Dad's and be notified of new posts by email.